After you install Spotify, double-click the Spotify icon to open the program (if it didn’t open automatically). A login dialog box appears. 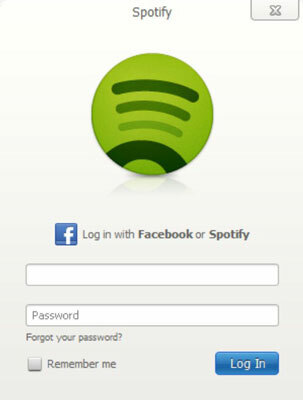 Enter your Facebook login details, or if you signed up for Spotify before September 22, 2011, you can use your Spotify username and password. If you’re going to be the main Spotify user on this computer, select the Remember Me check box so that you don’t have to type in your credentials every time. Click the Sign In button to log into your Spotify account and open the main Spotify window, where all the action happens! After you log in, you can always log out by choosing File→Log Out, and you can reenter your details or someone else’s. You probably have a software firewall activated or installed on your computer — the firewall acts as a powerful force field against Internet nasties. 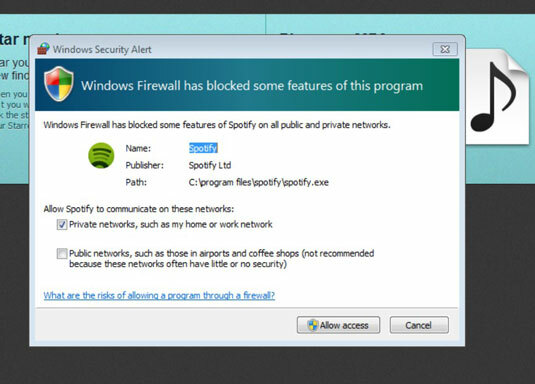 Because Spotify’s a new program on your computer that sends and receives data, your firewall might complain about it at first. Also, if Spotify is blocked (which might happen if you’re using it in a workplace), ask the IT department whether they can allow you to access Spotify. After you log into Spotify, a welcome screen appears, encouraging you to start listening to music right away. Because Spotify is so closely tied to Facebook these days, it wants you to send your listening data to Facebook and associate it with your Facebook profile. This setup makes the music experience far more social, but if you don’t want to allow this connection, uncheck the Get Personal Recommendations by Sending Music You Play to Facebook’s Open Graph check box. Then click I’m New to Spotify, Let’s Go. You can always turn the option on (or off) in your Spotify preferences. Spotify also starts scanning your computer for local files — you can see whether the scan is still going on by looking for the couple of spinning arrows next to Local Files, on the Spotify window’s left sidebar.